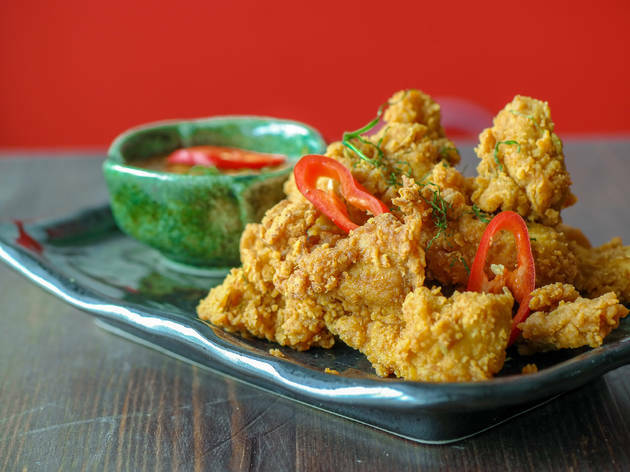 A street food stall- turned-permanent north London laksa bar. 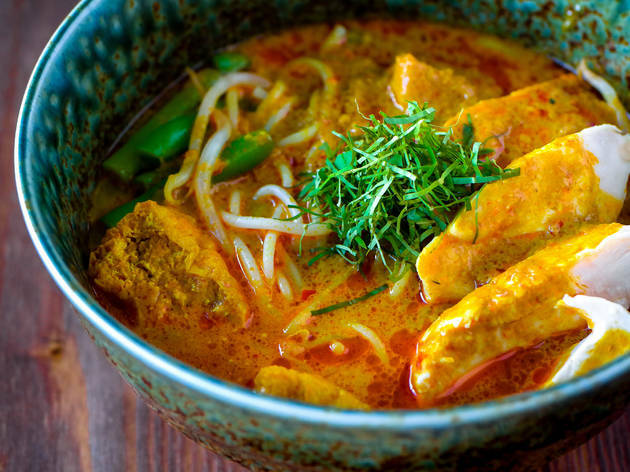 There’s been a lot of buzz about this north London ‘laksa bar’ and it’s easy to see why. 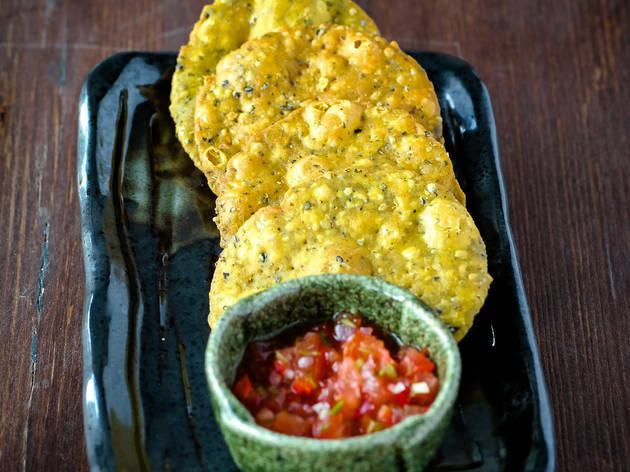 First of all, it started life as a street food stall, as many of the capital’s coolest restaurants do. Secondly, it’s fun: a London take on a backpacker café, with vibrant colours, effervescent staff and mainstream pop on a loop (Amy Winehouse’s ‘Rehab’ played twice in an hour). Third, it’s cheap. As for the food, much of it is great. The strongest dishes are the mains, which Kuala Lumpur-born lawyer-turned-chef Mandy Yin has clearly honed. 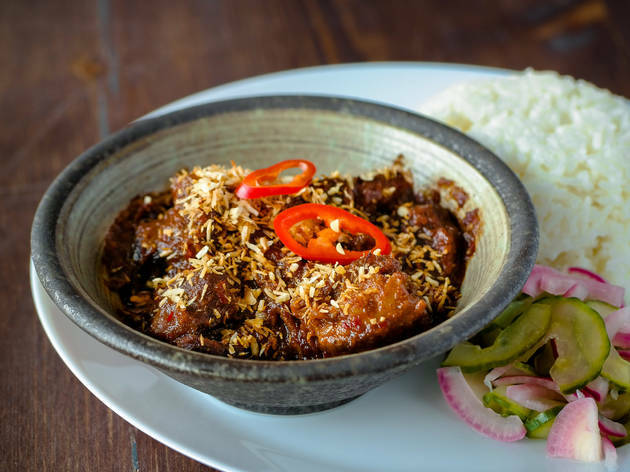 Rich and intense, the beef rendang also had a slightly sweet edge, which won’t be to everyone’s taste, but you can’t argue with the glorious softness of the meat. But the most memorable thing here is, predictably, the laksa. You can have it plain or pimped, with extra chicken, prawns, veg or egg. Order it plain: it’s best – and best-value – at its most basic, which includes puffy, satisfyingly chewy strips of tofu (delicious), rice or egg noodles (comforting, if a tad soft and bland) all set in or on the rich, swirling red of a fiery, fragrant, coconutty base. There was a small heap of pickled cucumber to one side, so good they should offer it as a main course. If you must add extras, go with chicken rather than prawn (more flavour), half a soft egg or strips of charred aubergine (delicious again). The smaller dishes needed tweaking. Fenugreek crackers were insanely good – get lots – but the Malaysian fried chicken needed seasoning and the peanutty dressing of the vegan gado gado salad was a little sweet. So, not quite culinary perfection. But a guaranteed good time? Absolutely. Dinner for two with drinks and service: around £65. 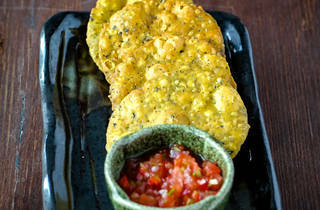 Sambal Shiok have recently launched a lunch menu with some new items. Including a great satay chicken burger. 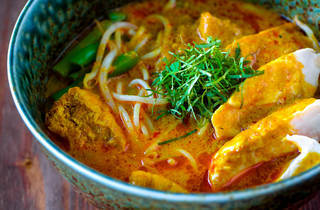 It’s great value for money as one bowl of the intensely tasty Laksa is enough for 2 people. Quick, friendly service. 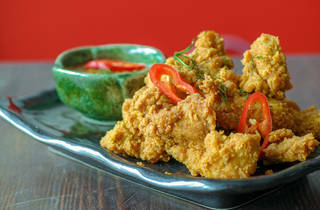 Can also recommend the Malaysian Fried Chicken. But get down there for the Laksa. 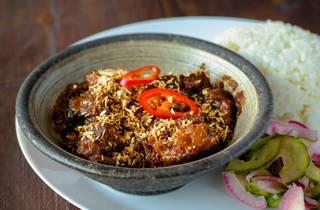 Deep, rich Malaysian flavours. Just what you need on a cold day. Quite disappointed. I live in the area and have been wanting to try the laksa here since it opened! If it had been good, this place would have become a regular option of mine for a easy casual dinner. We ordered a chicken and a prawn laksa. Personally found the prawn better but still found both lacked flavour and were just a bit boring. Ordered the Malaysian fried chicken as well and asked for this to come out first (as we knew the laksa would be spicy and wouldn’t be able to taste anything afterwards) but unfortunately the chicken came out last which felt like a waste. For the laksa itself, it’s quite pricey especially considering if you sit at the bar you watch your dish being made and there’s really not much to it in terms of ingredients and labour. Service was very friendly and attentive however!